Sean Severson is in his ninth season as Grove City College head men's and women's cross country coach. Severson has guided Grove City's traditionally strong program to even greater heights during his first eight seasons. Both the men's and women's programs have emerged on the regional and national landscape during his tenure. The women's team has won the Presidents' Athletic Conference title in each of his eight years and the men have won six conference crowns in that span. In 2010, the Grove City women's team made its first-ever appearance at the NCAA Division III Championships, placing 29th nationally. Additionally, men's standout Garrett Cichowitz advanced to the NCAA meet for the third consecutive season on an individual basis. Last season, the Wolverine women captured fifth place overall at the NCAA Mideast Regional Championships. In 2009, Severson guided Grove City's teams to top 10 finishes at the Mideast Championships. The women placed fourth and the men earned 10th place at the regional meet. Sara Fisher, Emily Pierce and Ella Smith all earned All-Mideast honors. Since 2004, the women's team has placed sixth or higher at the Mideast Regional seven times. Meanwhile, the men's team achieved top 10 finishes four times in the last six years. Two runners have achieved NCAA Division III All-America status during Severson's tenure at Grove City. In 2004, Elisa Pedersen became Grove City's first women's cross country runner to become an All-American. She again accomplished that feat as a senior in 2005. In 2007, Kristen Carter became Grove City's second women's cross country All-American. Overall, Grove City runners have qualified for the NCAA Championships in seven of Severson's first eight years as head coach. Grove City runners have earned 11 total PAC Most Valuable Performer awards over the past eight seasons. A total of 54 runners have achieved First Team All-Presidents' Athletic Conference in that span. Severson received PAC Coach of the Year recognition in 2004, 2005, 2007, 2008, 2009 and 2011. 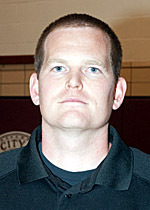 Severson is also the assistant men's basketball coach at Grove City. In that role, he is heavily involved in scouting, practice development and recruiting. He helped the basketball program earn four consecutive postseason berths along with the 2007 and 2010 conference titles. A native of Menomonee Falls, Wis., Severson earned a bachelor of arts degree in athletic training from the University of Minnesota-Morris in May 2002. At Minnesota-Morris, Severson captained the basketball team and earned Academic All-Conference recognition from the Northern Sun Conference three times. He also earned Dean's List honors. Severson earned his master's degree in health and physical education in 2004 from Adams State. He also owns Certified Strength and Conditioning Specialist distinction from the National Strength and Conditioning Association. He lives in Grove City with his wife, Tara, and their four daughters.